Last week I explained how layer-2 and layer-3 packet forwarding works in VMware NSX – a solution that closely emulates traditional L2 and L3 networks. Hyper-V Network Virtualization (HNV) is different – it’s almost a layer-3-only solution with only a few ties to layer-2. Hyper-V Network Virtualization started as an add-on module (NDIS lightweight filter) for Hyper-V 3.0 extensible switch (it is fully integrated with the extensible switch in the Windows Server 2012 R2 – more about that in another blog post). This blog post describes HNV packet forwarding in Windows Server 2012. The follow-up blog post documents the HNV behavior in Windows Server 2012 R2. Hyper-V extensible switch is a layer-2-only switch; Hyper-V network virtualization module is a layer-3-only solution – an interesting mix with some unexpected side effects. A distributed layer-3 forwarding architecture could use a single IP routing table to forward traffic between IP hosts. Similar to traditional IP routing solutions, the end-user would configure directly connected IP subnets and prefix routes (with IP next hops), and the virtual networking controller (or the orchestration system) would add host routes for every reachable host. Forwarding within the virtual domain would use host routes; forwarding toward external gateways would use configured IP next hops (which would be recursively resolved from host routes). Hyper-V network virtualization cannot use a pure layer-3 solution due to layer-2 forwarding within the extensible switch – two VMs connected to the same VLAN within the same hypervisor would communicate directly (without HNV involvement) and would exchange MAC addresses through ARP requests. 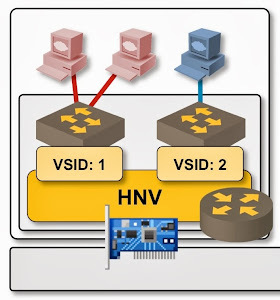 The same communication path has to exist after one of them is moved to a different hypervisor with Hyper-V live migration – HNV must thus support a mix of layer-2 and layer-3 forwarding. MAC reachability information – outbound ports in pure layer-2 world or destination transport IP addresses in overlay virtual networks. IP routing table is installed in the Hyper-V hosts with the New-NetVirtualizationCustomerRoute PowerShell cmdlet, ARP table and MAC reachability table are installed as CustomerIP-MAC-TransportIP triplets with the New-NetVirtualizationLookupRecord cmdlet. Hyper-V Network Virtualization supports IPv4 and IPv6. An IP address mentioned in this blog posts means IPv4 or IPv6 address – but do keep in mind that you have to configure IPv4 and IPv6 network virtualization lookup records independently. Send frames with unknown destination MAC addresses to the uplink interface. Flooded frames, frames sent to unknown MAC addresses, and non-IP frames are dropped. Traffic between IP subnets is intercepted by HNV module based on the default gateway destination MAC address (which belongs to HNV). Hyper-V extensible switch sends the traffic toward the default gateway MAC address to the uplink interface (unknown destination MAC address rule), where it’s intercepted by HNV, which performs layer-3 lookup. Inter-subnet IP packets are sent to the MAC address of the default gateway (virtual MAC address shared by all HNV modules), also intercepted by HNV module, and forwarded based on destination IP address (when the HNV module has a New-NetVirtualizationLookupRecord for destination IP address) or destination IP prefix (when there’s no New-NetVirtualizationLookupRecord for destination IP address). Summary: Even though it looks like Hyper-V Network Virtualization in Windows Server 2012 works like any other L2+L3 solutions, it’s a layer-3-only solution between hypervisors and layer-2+layer-3 solution within a hypervisor. Overlay Virtual Networking webinar describes architectures from numerous vendors, including Cisco, VMware, Microsoft, IBM, and Midokura. VM2 is running as a router. I setup necessary routing policy to make sure 10.0.0.1 is pingable from the VM1. Question is what if VM needs to talk to outside world? There are two gateways in this setup: 192.168.2.1 and 10.0.0.1. My question is which gateway will be used by the VM if the packets need to reach public internet? 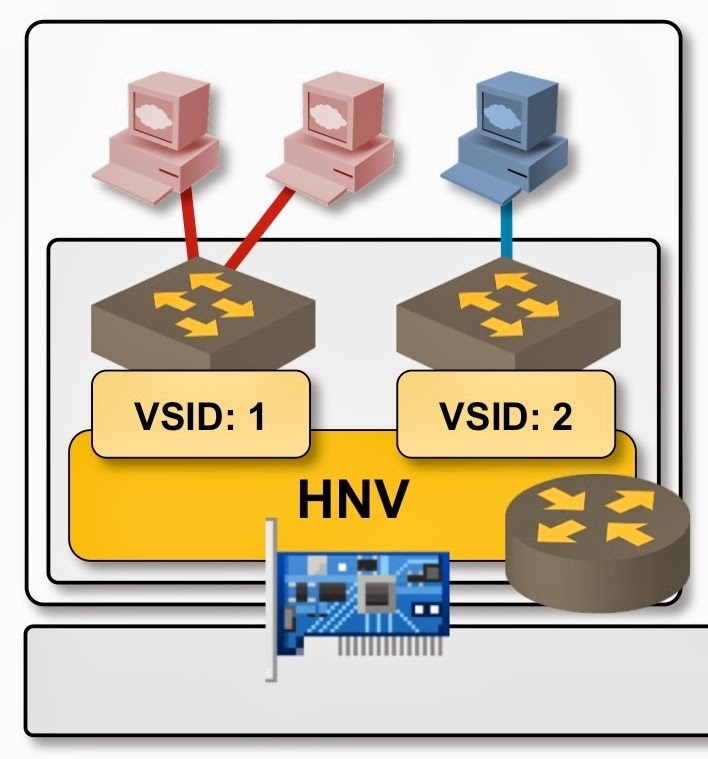 You say: >>>two VMs connected to the same VLAN within the same hypervisor would communicate directly (without HNV involvement) and would exchange MAC addresses through ARP requests. This is because, by default, the Hyper-V Virtual Switch is configured in Trunk Mode. Assign a VLAN ID on the Virtual Switch and then you will see the difference. Another point you make is this "Flooded frames, frames sent to unknown MAC addresses, and non-IP frames are dropped." Are you sure about this? VM gateway will handle non-IP packets. >>>Send frames with unknown destination MAC addresses to the uplink interface. By default, this is not the case unless you have a Type: WildcardGateway set in IP routing table. This is how Cisco 1000v and HNV Gateway works. WildcardGateway entry is created for each VSID. >>>Even though it looks like Hyper-V Network Virtualization in Windows Server 2012 works like any other L2+L3 solutions, it’s a layer-3-only solution between hypervisors and layer-2+layer-3 solution within a hypervisor. It has to be like as you said. Without this, you cannot route packets between different VSIDs.